Melinda Binkins and Barbara Wyles from Kiama Downs have again returned from the Australian Sheep and Wool Show at Bendigo after wins in the Woolcraft Section. 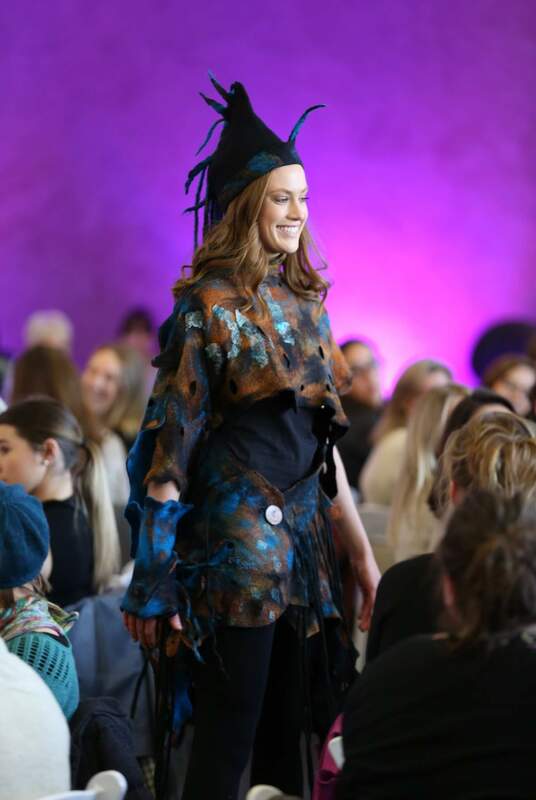 Melinda received a 1st, two 2nds and three 3rds for her felted clothing, including wearable art, with four of her garments featured in the prestigious Woolcraft Parade (right). Barbara received success in the hand knitting and spinning section, with 1st place for a hand knitted Tam-o-shanter in Scottish wool, a 2nd for a hand knitted black shawl in alpaca and silk, and another 2nd for a skein of Merino/Corriedale wool. Melinda’s wearable art garments will be on display at the Illawarra Feltmakers Inc’s annual South Coast Fibre Muster in Gerringong, and one of Barbara’s prize winning shawls will be the guessing competition prize at the event. At the Muster will feature the work of spinning, weaving and felting groups, traders selling specialist supplies, demonstrations, a Best Sheep in Show Competition (where members of the public and groups are being encouraged to make a sheep and enter it for $2), and a visit from Kev the Alpaca who has his own Instagram site. An entry form for the Best Sheep in Show Competition can be downloaded from The Illawarra Feltmakers Inc. web site.